Lynne Murphy is Professor of Linguistics at the University of Sussex. She grew up in New York state, she studied Linguistics at the Universities of Massachusetts and Illinois, and has taught in South Africa and Texas. Since 2000, she has lived in Brighton, England, where she now has an English husband and English daughter. 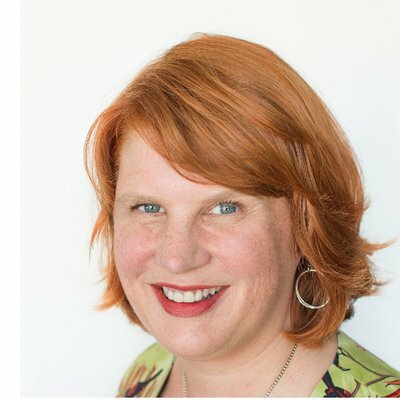 She blogs as Lynneguist at the award-winning blog Separated by a Common Language and in 2016 she was a National Endowment for the Humanities Public Scholar. Murphy is the author of several books, including Lexical meaning (Cambridge Textbooks in Linguistics, 2010) and Semantic relations and the lexicon (Cambridge University Press, 2003). 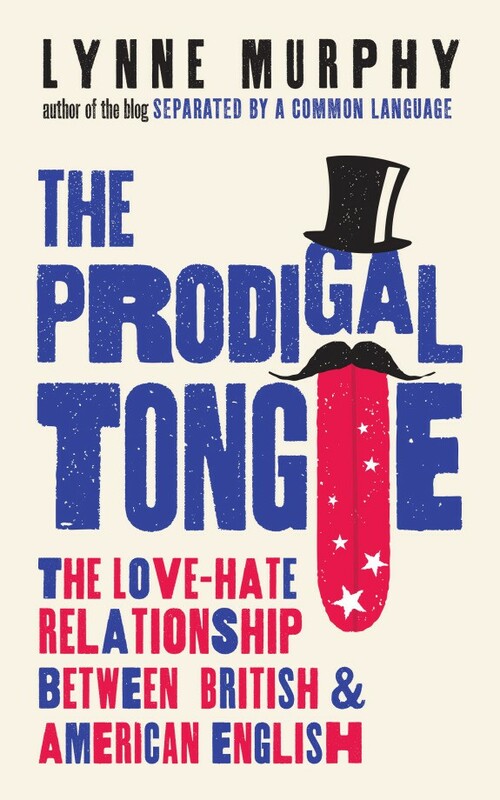 Her most recent book, released this spring in the US and UK, is The Prodigal Tongue: the love-hate relationship between American and British English. Ed Battistella: I’m really enjoying The Prodigal Tongue. You’ve coined the term Amerilexicosis. What is that? EB: Do the British have a linguistic superiority complex? Or does the US have a bit of an inferiority complex, language-wise? LM: They both can be true—and they feed each other. There’s a tendency for British (especially English) people to view standard British English as “the real thing” and to see the parts of American English that differ as “mistakes” or “non-standard”. But Americans don’t tend to see the British differences as mistakes, and they often assume that if it’s said in England, it must be proper. Americans often admire British English, and that helps stoke the British feeling that their English is the best one. A big part of what I’m trying to communicate through The Prodigal Tongue is that the assumptions underlying those attitudes are often just wrong. The English spoken in Britain is no older than the English spoken in America, in that they both started with the same people on a certain island. The differences we see in Britain and the US aren’t there because a new English sprouted up in the colonies, but because the language forked and developed in different ways in different places. The English now spoken in England is not “original English”. It’s just “sedentary English”. EB: Does language mean different things emotionally to the average Brit versus the average American? LM: We probably have to be careful here when talking about “the average Brit”—since not all Britons are English and the English have a different relationship to the language than the Scots or Welsh do. The thing that’s hard for Americans to really understand is how much accent matters in Britain and how much accent is intertwined with social class—and even what social class means in the British context. I mean, Americans have accents and they belong to socioeconomic classes, of course. And we know some accents are discriminated against in America. But most Americans just do not have the kind of accent–class sensitivity that comes naturally in England, where the highest-status accent has its own name: Received Pronunciation. It even has a nickname: RP. Americans seem to get more exercised about grammatical things and punctuation and the like. Perhaps not the average American, but those who have reason to think about language. When I get a new follower on Twitter and I see they’ve written “Team Oxford Comma” in their bio, I can be pretty sure it’s an American. The style guides, like the Chicago Manual of Style or Associated Press Stylebook, are huge in comparison to their modern UK counterparts. National Grammar Day is an American invention—and so forth. In some places where Americans use hard-and-fast rules about grammar, British writers and editors are more willing to say “see what sounds right in the context”. Which is to say, Americans are more willing to be told what to do grammar-wise (and to then tell others what to do). That sounds kind of subservient to the rules, which you might not think of as an American characteristic. But it is! And I think it comes from a really democratic urge. If the rules of grammar are written down, they can be the same for everybody and everybody can pull themselves up by their bootstraps and learn those rules. The British way relies on having an “ear” for the language—something that you’re not taught and that not everyone can be expected to do well. I talk about this a lot in the book—that for Americans, English is a tool that anyone can learn to use well (if they try hard enough). In England, though everybody uses English, there is a sense that not everyone is expected to be able to really master it—it’s not so clearly seen as a teachable skill. Though I think this difference goes way back to the start of the United States, it’s probably been strengthened by the fact that most Americans have not-so-long-ago ancestors who had to learn English as a second language. EB: As an American living and working in England do you find people commenting on your speech? What do they say? LM: When you’re an American in England, Americanness becomes your main identifying characteristic and personality trait. I’m not “that red-headed woman” or “that professor from the university”, I’m “that American woman”. These days, I tend to get comments like “Your accent is rather soft”—because I often hit my t’s in words like butter and my vowels have moved in the direction of the people around me. (I’ll never be mistaken for English in England—though I’ve had people in the States think I’m British.) But a big part of the reason those vowels have moved is because I was mocked for my Great Lakes vowels when I first moved here. So, when I say box in England, it’s a bit more like “bawks” now, rather than my native “bahks”. People do tend to assume that anything unfamiliar that comes out of my mouth must be an Americanism—so often I have to explain, “no, that’s just a Lynneism”. EB: A lot of the differences you discuss are very subtle and go beyond the usual biscuit-and-cookies sort of thing. Can you give us a couple of examples of the complexity of linguistic differences? LM: Well, even the biscuit-cookie thing is complex, because the British now use the word cookie, but they don’t use it like Americans do. Many Brits make a distinction between biscuits (which are the cookies they’re used to eating—they’re always crunchy) and cookies, which are the big soft, round ones you can buy in the mall, plus Oreos and anything with chocolate chips—that is, the specific recipes that have been imported from the US. When I make cookies out of my Betty Crocker cookbook, my English friends don’t recognize them as cookies. They compliment me on my “little cakes”. Their meaning of cookie just doesn’t extend as far as the American one does. I have a lot of food examples in the book, I could talk about them for days. But to try to give you something different, there’s middle class—which in American has the feeling of ‘normal, just like everybody else’, whereas in Britain middle class often connotes something more like ‘well off’ and even ‘pretentious’. EB: You also have a terrific blog, Separated by a Common Tongue. Did the book emerge from the blog? LM: I’d say the blog gave me the opportunity to write the book. I started the blog as a hobby, to satisfy my lexicographical desire to write down the words and meanings I was learning in England. As the blog became more popular, I started talking about the subject in a lot of public venues. I gave a talk called How America Saved the English Language to a lot of English audiences. It provided the outline of the first six chapters of the book. When I started writing the blog, my professional research was more about how vocabulary is organized in the mind. I was researching things like how children learn which words are opposites. This is to say, I was not a sociolinguist or a language historian. But as I wrote the blog, I wanted to learn more about the hows and whys behind the differences, and so I learned a lot about it. And then I had enough for a book that really looks at the issues, rather than just listing differences. EB: Are there some Briticisms that play better in the US than others? And vice versa? But if by “play better” you mean that Americans enjoy these words as Briticisms, my sense is that Americans love British words that sound a bit silly to them. I’ve been watching The Good Place and there are a number of points where British English is gently mocked as silly and incomprehensible. My colleague Justyna Robinson and I are currently doing some research into how British English is stereotyped in American culture and I’ll be including some Good Place material in that! I have a project in development where I look at how British people continue phrases like “As the Americans say…” or “This is what the Americans call…”. These crop up a lot in British media and politics, and they’re often expressions with roots in metaphor. Whether they’re actually things that Americans say is another matter. Sometimes they’re not, but they reveal a bit about what the British sense of “Americanness” is. So it might be said that colorful American metaphors go down well. EB: I imagine that some difference between British and American are dialect sensitive —and that some differences pertain to some British speech but not others. Is that the case? At the level of spelling, it’s easy to make the international comparisons. For vocabulary and grammar, you have to be a little careful. EB: Can you enlighten us on the pronunciation of “h”? LM: You mean the name of the letter? The usual in Britain, like in the US, is to call it “aitch”. But in the UK, it’s increasingly called “haitch”, which is a fairly common pronunciation in Ireland and may have some class connotations in England — that is, haitch is often heard as a bit down-market. Some might say it that way because they are hypercorrecting—they want not to be dropping their h’s, since h-dropping has been a marker of lower-class speech since the 1800s. So they add an extra h just to be sure. (The British did the same with herb—starting to pronounce its h in the 19th century.) But haitch also might stem from the sense that almost all the other letters have names that start with their sound. So why shouldn’t H? All I know is: my 10-year-old says haitch a lot, but she also sometimes catches herself doing it and corrects to “aitch”. I think it must be a matter of discussion in her school. EB: Are you working on another book? LM: At the moment, I’m trying to get some smaller projects into press. But I do tend to have book-sized ideas, and I’ve got two book proposals burbling in my head. The problem now is choosing between them. EB: Thanks for talking with us. 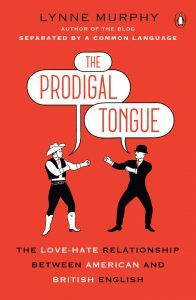 I love The Prodigal Tongue. But I notice that the UK and US editions have different covers. What’s up with that? LM: It has two different publishers, so they get to have their own way with it, and publishers have firm ideas about what will work in their markets cover-wise. I think they know what they’re doing, because both my husband and I have had books with different covers in the US and UK, and our American friends tell us that the US covers are better, and our British friends tell us the UK covers are better. I insisted that the subtitle differ by country: that American should come first in America and British in Britain. It was a nice idea, but it’s made talking about the book a bit more difficult when I’m speaking with international audiences! It’s been great talking with you, Ed. Thanks!